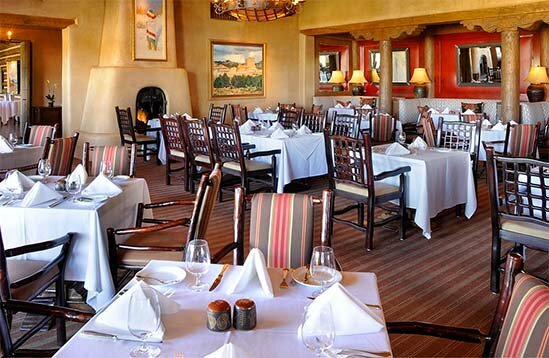 The Hacienda Dining Room offers world class cuisine along with a bar menu to satisfy every diner’s taste in addition to weekly specials paired with the perfect wine. The Torreon Portal is a seasonal favorite located just outside the Hacienda Dining Room. It offers a sheltered exterior patio overlooking the 9th hole of the Sunrise Course and serves light fare for before, during, and after golf. You can even place your order from the courtesy phone on the 9th tee box and your lunch will be ready by the time you finish the hole. The Spa Café at the Fitness, Tennis and Spa Center is open for breakfast and lunch from Memorial Day to Labor Day and offers poolside service. The Log Cabin is located next to the Equestrian Center with a casual atmosphere that specializes in home style cooking and comfort food along with many takeout options.